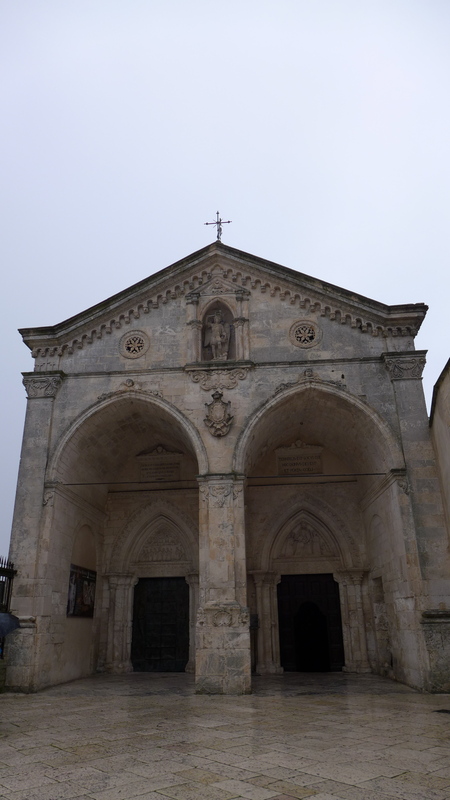 The Sanctuary of Monte Sant’Angelo is located on Gargano, Italy. It is the oldest shrine in Western Europe dedicated to the archangel Michael. Legend has it that in 490 AD a farmer lost a fine bull. He search all over for his bull. He climbed the mountain looking for his prized bull for hours. Finally after a long search, he found the bull standing at the entrance to a cave (grotto) at the top of the mountain. The man tried to lure the animal away, but nothing helped. After trying to lure the bull away, the man thought, “I’m going to teach this bull a lesson.” So he grabbed his bow and arrow and tried to shoot the bull. Instead of the arrow hitting the bull, the man claimed that the arrow turned around and hit him, killing him in the process. Hearing of this incident, the archbishop instructed the local citizens to fast for three days. The bishop went to the mountain to investigate the incident and pray. During the course of the fast, St. Michael appeared to the bishop and revealed to him the significance of the event. The location of the incident was consecrated by archangel Michael and from that point was considered a sacred place. Although the area was never formally consecrated by a priest, millions of people have traveled and continue to travel from all of over the wold to make a pilgrimage to this sacred grotto consecrated by Saint Michael, the protector. On the day we visited the Gargano area and the Sanctuary, it was very foggy/cloudy. After the exhilarating ride up the mountain, one of the first things we saw was an imposing castle. We did not explore this castle; we simply walked by it on our way to the majestic Monte Sant’Angelo. As we made our way to the Sanctuary, we got to experience a little piece of Gargano. We walked through small street with vendors selling souvenirs, cheeses, charcuterie and baked goods. As we walked down the road, the tower attached to the Sanctuary became visible and we arrived at the Sanctuary’s courtyard. The Sanctuary contains architectural notes that span from the 7th to 15 centuries. When you walk through the gate, what you see is the newest parts of the Sanctuary. To get to the oldest part of it, you have to travel down through the building and through a museum site. One of the most amazing pieces housed in the museum is a hand-carved baptistry. This baptistry contains carvings of the four evangelist in scenes from the Bible. Another interesting piece is a statue of St. Michael after vanquishing Satan in the form of a snake. There were other interesting antiquities on view in the museum that were equally awe-inspiring. As you approach the oldest part of the Sanctuary, the floor becomes more uneven and you can see where earlier pilgrimages entered the Sanctuary. You can see the remnants of a set of stairs leading into and out of the Sanctuary where pilgrimage participants would enter and leave the Sanctuary. Visiting Monte Sant’Angelo was a deeply moving experience. As I took in the architectural beauty of the Sanctuary and as I gained a true understanding of the importance of it to so many people through out the millennia, all I could feel was pure astonishment. As I departed the Sanctuary, I realized that I had experienced some thing truly remarkable. the visit to this lovely town and shrine was one of the highlights of our trip to Puglia. Thank you for your comment. This was one of my favorite spots in all of Puglia.